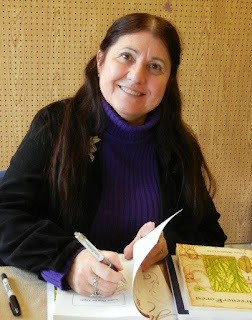 The Writers' Lens: Vonnie Winslow Crist: Creative process an "earthquake"
Vonnie Winslow Crist: Creative process an "earthquake"
Welcome to Vonnie Winslow Crist, a versatile writer and friend I met through Broad Universe. She is the award-winning author-illustrator of two speculative short-fiction collections: The Greener Forest and Owl Light; a YA novel, The Enchanted Skean; two speculative eShorts, Blame it on the Trees and For the Good of the Settlement; a children's book, Leprechaun Cake & Other Tales; and two myth-based poetry collections, River of Stars and Essential Fables. Mushroom fairy-rings constantly sprout up in her yard, wild birds have been known to land on her shoulders, and Vonnie has found so many four-leafed clovers that she keeps them in jars. What brings your writing into focus-- the characters, the stories, the love of words? I looked the word focus up in my old Standard College Dictionary, and decided to use the meaning: “In seismology, the point where an earthquake begins.” I think of the creative process as an earthquake that can rearrange the landscape, change people's lives, and make us rethink our priorities. So where does the earthquake for my writing begin? It can come from an archaic word I stumble upon or a scrap of folklore or a strange superstition. It can originate from a conversation overheard at a restaurant or a person I observe on a train. For me, once the spark is ignited, the characters and story follow. And since I love words: quirky words, forgotten words, words that sound lovely, words that have double meanings (the list goes on), it's a joy to set down on paper the words that carry the narrative forward. What inspired your latest book? Many of my favorite books are fantasies which follow the journey of an unlikely hero. I think I've always wanted to write an adventure-filled novel set in my own fantastical world that referenced Joseph Campbell's hero's journey. 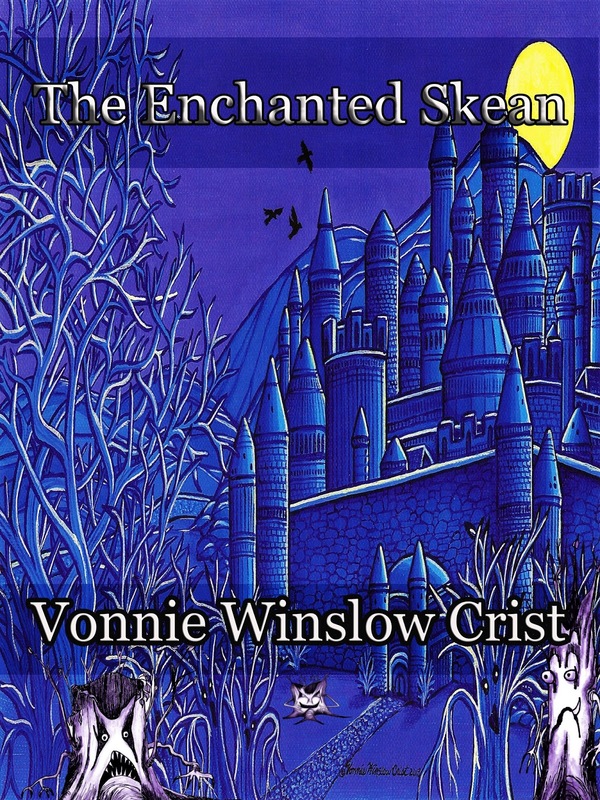 I have vivid dreams, and among those dreams was a world filled with the races, creatures, and characters that populate The Enchanted Skean. While dreaming, I found myself looking out of the eyes of Beck, a 14-year orphan who lives with his grandmother. And so, he became my protagonist. Also, I must admit to being determined to write a piece of fiction that included a gruesome family tale told to me by several great-uncles and my father. It seems one of my ancestors is buried in two places. In one grave are his bones, and in another his flesh. When Beck is sent to retrieve his father's bones, his solution to a problem with the bones is exactly the one chosen by one of my ancestor's cousins. What do you think readers will like about your book? I think readers will like the fully developed fantasy world in which the story takes place, the sense of adventure and danger that moves the story forward, the battles and other action, and the unique characters and races who populate the novel. I also think they'll enjoy watching a boy who thinks himself forgettable grow into a memorable hero. And the magic is fun, too! Would you share a bit about your next project? Even as I type this, Owl Light, a collection of speculative stories with a pinch of poetry and illustrations is in the final stages of production. But I'm not sure I'd count that, since it's really completed. I have another YA novel, which I've been working on that I'd like to complete prior to writing the sequel to The Enchanted Skean. It's actually a science fiction novel with a female protagonist. It features colonies of dragon-like creatures called bodaway, the balance between honoring old traditions and new ideas, guild members who harvest nests from caves, and murder. I've got about 15,000 words written that I'm pleased with, and more words written that I'm less than pleased with! Is there a different genre or type of book you’d love to try to write? I've always loved history. I have access to lots of wonderful family letters both from the Civil War and World War II. I think I'd like to write at least two non-fiction books that utilize those letters and additional researched information about the actual battles my family members participated in. The personal stories are fascinating, and both of those eras are of interest to me. But I'll have to polish my footnoting skills if I move forward on those projects! The Enchanted Skean – Book I of The Chronicles of Lifthrasir is a 430-page, Young Adult fantasy novel filled with action, adventure, and magic. 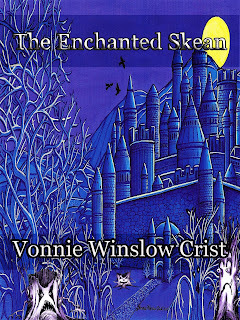 THE ENCHANTED SKEAN: 14-year old Beck Conleth is living a quiet life in the seaside town of Queen's Weather when his grandmother sends him on a journey to Ulfwood to retrieve his father's bones and a family skean (dagger). After reaching Ulfwood, Beck discovers the skean is magical, and that it answers only to him. Soon the enchanted skean and its owner attract the attention of dark mages, goblins, and worse. Helped on his journey home by Wisewomen, warriors, shape-changers, and the other good folk of Lifthrasir, Beck faces death, danger, and the theft of his skean. Accompanied by his best friend, Beck stows away on a ship, takes back his skean, befriends a dragon, and escapes with a troop of retrievers of stolen items. After reaching a dock in West Arnora, the company heads for the fortress of Ravens Haunt. As Beck and his companions face a hideous Skullsoul and an army of ogerhunches, he realizes there is a developing confrontation between good and evil, and he and his enchanted skean have a role to play. Thanks for reading and commenting on The Writers' Lens. This is T.W. Fendley. You can find more about me at www.twfendley.com. Certainly, Vonnie -- I was my pleasure. I know I enjoyed learning more about you and your work. That's an incredible true story behind The Enchanted Skean. Real life can be stranger than fiction.